I just spotted Carrie/Child's Play, The Ninth Gate/See No Evil, The Silence of the Lambs/Mr. Brooks, Saw/Saw II, and Predator/Commando 20th Century Fox double feature Blu-ray packs for only $20 a pop at the Great Retail Satan. These aren't stripped down versions; just the normal existing editions shrink-wrapped back-to-back. Pretty cheap considering these where $25-$35 a piece a few months ago. 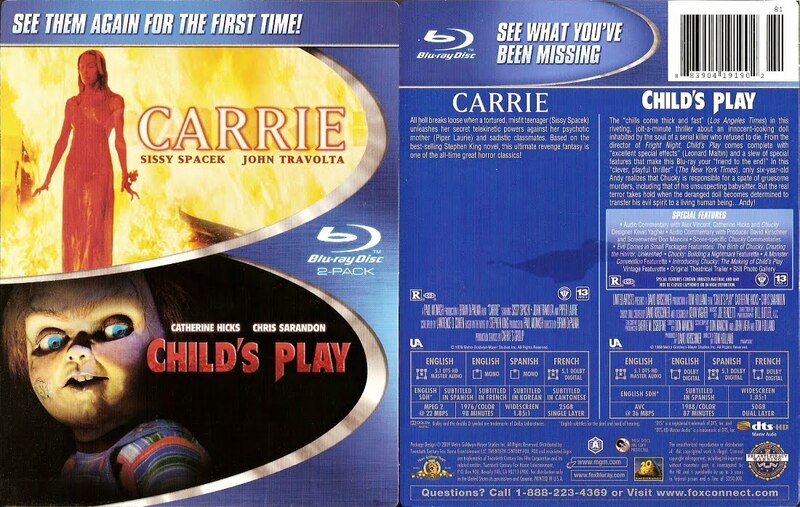 I picked up Carrie and Child's Play since former looks decent yet bareboned while the latter looks great and is extra feature packed. Also for some reason Child's Play has the identical special feature-wise 20th Anniversary DVD included as well. Concerning the others, The Ninth Gate's transfer has been grain-scrubbed, The Silence of the Lambs could definitely look better, and Saw is extra-less. Also picked up the DVDs of Savini's Night of the Living Dead and a quad-feature pack of Pumpkinhead 2/Leprechaun/Wishmaster 1 & 2 for just $5 a piece....and some detergent. This is a good deal on these films, both of them look nice (although I am nowhere near the expert on transfers) and the Child's Play extras are a nice addition. Saw 3, 4, 5 Blu-Ray 3 Pack is $20 also. YMMV I had to visit 4 Wal*Marts to find one that had them. Each comes in its own case, they're wrapped together. My First SECAM Format Tape Has Arrived! Remember when this video was like plastic gold? Who says Hot Topic never has anything cool? Am I a bad person...?